Is Adderall Needed For College Students to Study? Adderall is a common pill used by college students to help them study for exams or just focus in general. Obviously it is a prescribed drug so these students should not have access to them. In my time being in college I have experienced multiple people obtaining this drug in thoughts of studying better. I thought to myself, how can someone put a pill down their throat when they aren’t prescribed or needed? This is a pill for people that have a serious diagnosed condition such as ADHD. What I discovered, which most students do not know is that their are actually some horrible side effects from taking this drug. This article says that anyone taking the drug that is not prescribed can encounter fast, pounding, uneven heartbeats and burning during urination. The list goes on about what can happen if you take this drug when not prescribed. I believe that if so many students are obtaining these drugs so easily then this needs to be enforced a lot more heavily. Also if students think they need it so badly, why not go get tested for these disorders themselves? There are perfect alternates to keep you awake such as caffeine pills and energy drinks. I do not know what the world has come to that college students have to illegally obtain these drugs to study. As someone with ADHD, I can promise you that this drug is not easy to get at all if you get them properly. Since adderall is a controlled substance, every month one has to go to the doctor to get a new prescription, then get it filled. So these people who are getting it easily, through a dealer, might need it. If it is only during finals week, most likely not. If anything, they could have a very minor case, in which 5 or 10 mg would be enough. This is a very interesting article, and I hope that any student who is legitimately struggling with ADHD can get the medication they need through a doctor. This is definitely a serious problem at colleges today. I have so many friends and know a lot of people who are constantly taking Adderall. A lot of times people are taking it so they can study hard for very long periods of time, especially when they need to stay up all night. I knew that it wasn’t good for them but I figured that it wasn’t to harmful. It is alarming that there are some serious effects that can happen, because there is such a large number of people using this drug even though they don’t need it. Colleges need to start cracking down more on this and find a way to stop the large amount of use of Adderall. 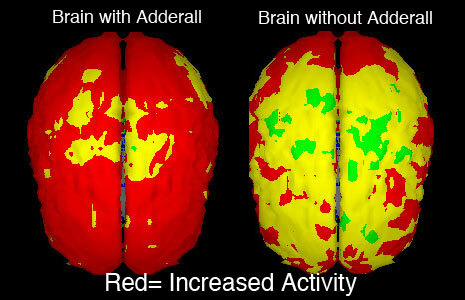 I don’t believe that adderall is “needed” for anyone but it can sure improve performance. However it seems like such a shortcut to cram studying when that isn’t even the most effective way to study. Great topic, I wish you had added more statistics and experiments that could validate your claims furthermore. This is something that needs to be addressed to all college students. Hopefully Andrew will discuss the side effects and long term issues that can come along with the use of adderall. What type of enforcement exists now and what do you think should be changed to reduce illegal adderall use? Also, maybe some students do not go and get diagnosed because of a lack of insurance, but they actually do medically need it.